When we attended the shareasale.com Affiliate Summit in Las Vegas we had the pleasure of meeting up with Affiliate Marketing Guru, James Martell , his lovely wife Arlene, Phil the tech guy and a small contingent of other students. 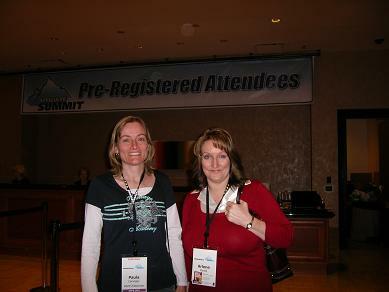 Here is Paula and Arlene at the Summit Registration desk Arlene has a website devoted to moms with children who suffer from epilepsy. The site is called EpilepsyMoms.com and is a must visit for anyone who has a child with this condition. Arlene has been through the trauma of having a child with epilepsy so she knows what you are going through and her site is full of information and resources to help any parent in this situation. The conference was full on as always and the information gained makes this meeting well worth while for anyone in the Affiliate Marketing business. Being at the Affiliate Summit and meeting with our fellow students was a lot of fun, usually we communicate through the online bootcamp sessions and the forums that James has put in place to assist us all. We spent some time talking to the lady from Popshops. Anyone who has an Affiliate Marketing site will find Popshops to be invaluable as a time saving tool that we recommend. We touched base with a number of Affiliate Networks with a view to getting more good quality, high converting merchants on our sites. This all equates to $$$’s in the long run so the Summit is the place to be. If you are looking to monetise your website or blog, it pays to deal with the Affiliate Networks who help to protect your income by making sure you do receive your payments and working with a Network makes it easier to find merchants with products relevant to your site.